If you're like me you get some of your best ideas in the shower. I need a way to offload those ideas so new brilliant ones can take their place. That's the thing about good ideas -- they take up so much brainspace that they leave no room for the new ones trying to get in. One way to offload these ideas for later processing is to write them down. This is often a problem in showers, most of which are not equipped with diver's notepads. So head over to your local Wal-Mart and buy a pack of Crayola Bathtub Crayons. 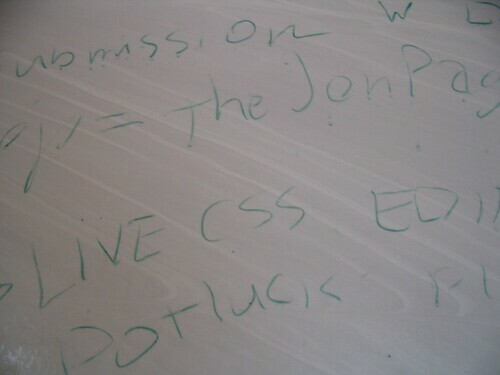 You can then write on the shower walls whenever brilliant ideas strike you (and they will!). posted by Jonathan at 3/11/2006 11:08:00 a.m.
By minijonb, at 4/06/2006 11:43 a.m.
Haha, that is brilliant! I hope I can get me some in Australia! By Greg, at 4/07/2006 7:29 a.m. I think this is a great idea! Sometimes I find that vocalizing ideas while writing also allows me to cross analyse their validity and potential for success. So to help with the shower crayons, you can also use a waterproof MP3 player/recorder to record what you are saying. And if you wanted to continue a thought in the shower later, then you could play it back on the MP3 player and comment on it with the crayons. By daemon_b, at 4/09/2006 4:29 p.m.
minijonb - haha! It's a form of meditation, no question. daemon_b - hm! Interesting idea about vocalizing! Have you tried that waterproof mp3-player idea? By Jonathan, at 4/12/2006 12:22 a.m. I did it with my children. My home semmed to be in ruins. I told them: Make some decorative draws!! So they drew on te walls all theirs ideas. It was wonderful!! When we leave tat house, we took som photos of them. Ideas and art go together!!! By Alejandra, at 4/13/2006 3:33 p.m.
By Jonathan, at 4/13/2006 8:14 p.m. Awesome! Quite the great idea! I have no idea, but my best ideas always come in the shower... Kinda like Archimedes, no? By Mafu, at 4/13/2006 9:58 p.m.
Hi Mafu - Love that Archimedes story! Thanks for letting me know! By Jonathan, at 4/14/2006 7:37 p.m.
brilliant idea ... my kids will love it and my husband too. By baby~amore', at 6/22/2008 3:53 a.m.
baby~amore - yup, they're definitely fun. Actually these days I'm using something different for capturing ideas in the shower. I use a waterproof notebook (Rite In The Rain brand, which I picked up in an art-supply store). 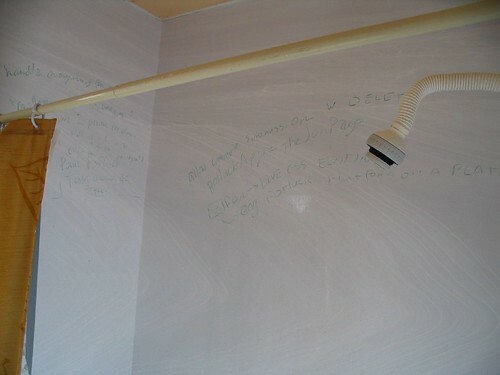 No mess to clean up, and it's easier to read (you can use a regular pencil or a mechanical pencil). By Jonathan, at 6/22/2008 9:25 a.m.
By Shower Thinker, at 3/23/2009 5:14 p.m.